On July 4, 2010, Beaubears Island Intepretive Centre launched and christened its brand new, 26 foot, 10 passenger Voyageur Canoe. Canoe excursions, with our Big Canoe Leader and trained bowperson, will take place aboard the intrepid “Sipu”. Your guides will undertake an excursion that provides a unique hands-on experience and journeys to Beaubears Island, as well as to Wilson’s Point, or simply connects waterways of the Southwest and/or the Northwest Miramichi. 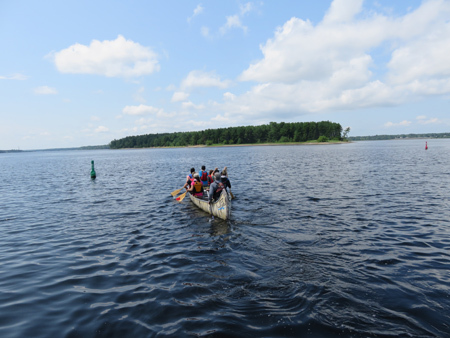 Participants have the opportunity to live part of our history through the vehicle of the canoe. Tours are subject to change based on tides, weather, and guests’ preference. For more information on any of these experiences, please contact 622-8526 or email ac.dn1555908807alsis1555908807raebu1555908807aeb@o1555908807fni1555908807.